Reaching 100 for Men -Stay Trim and Have Lots of Kids.. Most studies say that the chances of reaching 100 are better for women than men. In fact of the centenarians currently living in the US, 85 % are women. However one recent study suggests a great way for men to increase the odds of reaching the triple digits - stay thin and have lots of kids. These findings came largely from data gleaned from World War I draft cards, which seem to suggest lean young farmers have the greatest chance of becoming centenarians. A common profile of many of the current centenarians in the study; in the past they were all trim, worked on the farm, and fathered many children. The researchers were actually quite surprised at the results of the study. The idea that multiple children could lead to longer lives seems to go against conventional wisdom. What parent out there hasn't said that having one or two, let alone three four or more children hasn't "aged them". But that is exactly the finding Leonid Gavrilov, and his wife, Natalia Gavrilova, well known researchers into the lives of centenarians and both of the University of Chicago's Center on Aging, presented at a recent meeting of the Gerontological Society of America. 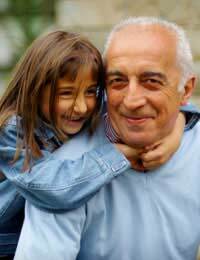 The Gavrilov's are the same pair of researchers that reported that children of young mothers have a greater chance of reaching centenarian status. This new research about male centenarians was driven by their discovery of a treasure trove of data from WW1 draft cards. Between 1917 and 1918 all men under the age of 46 had to fill out these draft cards, which required detailed information about their family and ways of life. Almost 250 of these men had a birth date of 1887. The Gavrilov's wanted to see how many of them were currently living as centenarians, and if they could draw any parallels on their backgrounds from the draft cards. They compared this group against a randomly selected group of men that were also born in 1887, but did not live to 100. The researchers found that in the case of the centenarians, those who were 30 in 1917 and by that time already fathered 3 children by that age, were 61% more likely to live to 100, than men who were childless at 30. Even more significant the study found that for the men who had 4 or more children before 30, the odds of becoming a centenarian tripled. Having many children young, meant those children were around to help throughout most of the parent's life. Another commonality of the group in the study was that twice as many men that listed "farmer" as their occupation on their draft card reached 100 as the rest of those in the group. Gavrilov suggests that this is because in the early 1900's farms were rather isolated and removed from the poor sanitation, overcrowding, and unsanitary conditions that were life-limiting in the more urban areas. Farmers also live robust lives, doing much physical labor, and of course eating good and natural foods they have grown themselves. Farmers tend to be thin, with lean muscle mass. All the men in the study with such physiques in their early years lived longer then their "stout" contemporaries.